Flexibly is a key component of ergonomic focused work environments, but it is also a component of forward thinking and creative environments. Sit-Stand workstations offer comfort in the ergonomic sense and comfort in the sense that a workstation can become a tool of flexibility. The creative aspects of sit-stand work components is found in the flexible nature that they can bring to the work environment. 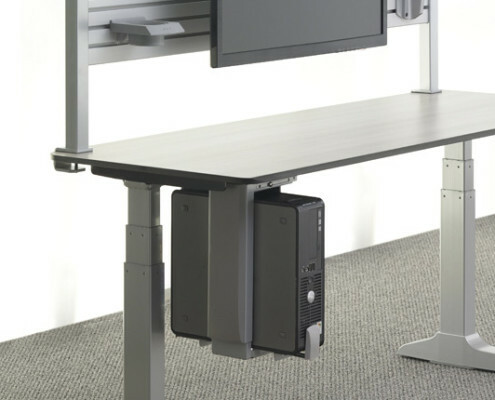 Picture a workstation that is equipped with a flexible flat screen monitor stand and an elevating keyboard and you have an ergonomic workstation that allows employees to sit and work or stand and work. That is one component of flexibility. The other side consists of pure creativity. Imagine the same workstation, but instead of the focus being ergonomics the focus become creative, functional, and inspiring. This is a workstation that by elevating the monitor and turning it, becomes a mini- presentation center where team members can collaborate around the center where work is created. What we are talking about is empowerment through design that enables products to have multiple roles within the scope of their designed function. That is not just empowering or creative that is business minded focus. Offers accessories that enable each of their workstations to be fitted with components that enable the creation of a creative and functional work environment. Whether you want a fully functional ergonomic workspace or the creative function of being able to enhance the creativity of your team, Maxon products are what will help you power that vision through ingenuity and form. Offers innovative design that begin with functionality and completes that task with style and elegance. ESI is a woman owned company and a prime example of the power of empowerment. Their ergonomic design fits the needs of a flexible work environment and their products easily encompass the creative and ingenuity of a multipurpose work space. The ESI product line is all encompassing and ranges from monitor arms to lighting. Developed with function and comfort as integral parts of the whole. Also offers innovation, comfort and function that protect and empower your workforce. The modern feel and easy to use products are easily adapted to an existing workspace, or they can become part of a new-working environment. Innovation that moves your forward – from adjustable desks and keyboard platforms to LED lighting and flexible monitor arms, Workrite Ergonomics has what you need to protect and empower your workers. The Portland business scene is forward thinking, creative, and offers the ingenuity to your business process. Empower employees to be comfortable in their environments. Use the ergonomic sense of function to empower employees within their workspace. Visit Portlands best source for office furniture for inspiration.